There seems to be a new virtual reality headset almost every month, and each of them is almost hyper-focused on making VR more immersive. But what if a company decided to use that same technology for something a little different? That's what Goovis is looking to do with the 4K Cinego. Instead of creating a headset that transports you into another reality, Goovis created a headset that can act as your own personal cinema. It's available on Indiegogo now for $499, and we even tried it out at CES 2018. We've used a few personal theatre headsets before, but this might be the best yet if it can get to market. The Cinego has a sleek black design that kind of makes you look like Geordi La Forge from Star Trek. Not worrying about the technological needs of virtual reality, however, has given Goovis plenty of room (and budget) to focus on the display. The Cinego sports two 1920 x 1080 OLED displays, 3,147 pixels per inch (it's also got a 10,000: 1 contrast ratio and under 0.1ms response time). For comparison's sake, the new HTC Vive Pro has a PPI of 615 while the Pimax 8K headset has about 800 pixels per inch. All of these pixels are intended to give you a great cinematic experience, with CEO Jonny Peng saying the company's goal is to "bring the IMAX experience to everyone, everywhere." We watched a bit of Avatar on it, and it really did make us feel like we were seeing it on the big screen. Not just that, but with a few adjustments the picture was crystal clear. Avatar was used to show that you could even get the 3D movie experience without wearing the glasses. Okay, yeah, you've still got a headset on, but you get our point. The headset runs on Android 4.4 and can stream a whole mess of apps, like YouTube and Netflix, says the company. It's also got 32GB of storage should you want to load up any of your own movies and TV shows; you can also expand with micro SD should you need more space for all your Game Of Thrones episodes. Even better, there's an HDMI in port so that you can connect your PlayStation 4, Xbox One or Nintendo Switch to game away. 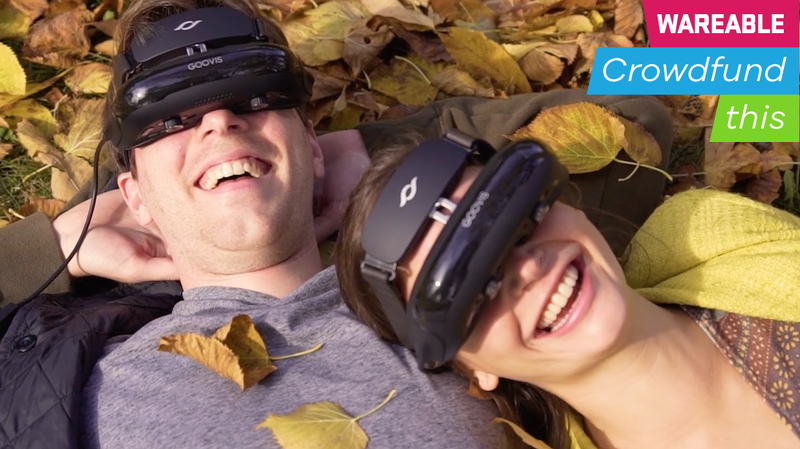 Cinego - Meet Your Personal Immersive 4K Cinema from CineGo VR on Vimeo. You can expect to get a decent amount of battery from the Cinego as well, as Goovis says you can get up to 4.5 hours in a charge. To save space and make the headset a light 200g, the battery isn't actually in the headset but in the attached controller, which you'll have to use anyway to navigate your way around the interface. If you're worried about your glasses fitting in the small headset, the Cinego includes an adjustable vision range where you can adjust the diopter for both nearsightedness and farsightedness. A question not even great detective Hercule Poirot could solve. The Cinego clearly has a lot of great technology in it, and it seems to have thought about everything. It's light, it works with external devices like your Nintendo Switch. You could even connect something like a 4K Roku or Apple TV to it, considering it's only using HDMI. Not only that, but it also comes with the ability to adjust the lenses so you can at least try to match your prescription, making it easy to watch without glasses. Plus the company has already started shipping devices to the earliest backers, showing that it can really make them. The two big questions are whether it can do it at scale and whether you're in the niche Goovis is appealing to. One of the big sells of this device is that it's a portable cinema. How comfortable are you sitting out in public with this thing on your face, watching a movie or a TV show? If you can't see yourself commuting with this thing on your face every day, then maybe it's not for you. But if you want that authentic cinema experience (minus people coughing through the movie) or if you're a big traveller with a burning itch to watch as many movies as possible, we can at least vouch for Cinego's visual quality. It's pricey, but for home entertainment nuts who want to just block out the outside world, this has promise.